Gotong-Royong! is nominated for the Best Writing – Info-Ed award at Pesta Perdana’s 15th edition. Cantik Detektif S4 is nominated for 2 awards: Best Host – Info-Ed and Best Writing – Info-Ed at Pesta Perdana’s 15th edition. My Mother’s Story wins the Gold REMI award for Biographical programming at the 51st Annual Worldfest-Houston International Film Festival. Best Editing award at the Apollo Awards. Revealing the Invisible edited by Rein Zahrein wins the Best Editing award (for Long-form Unscripted) at the Apollo Awards. The Moving Visuals Co. wins Hermes Platinum Awards for Facing Dementia (Documentary); Revealing the Invisible (Documentary) and Bespoke (Factual Entertainment). My Mother’s Story – Nona Asiah “A Life of Song” filmed by S. Ananth is nominated for Best Cinematography at the Asian Television Awards. Big Food wins Best Infotainment Series at the Asian Rainbow TV Awards in Macau. Big Food’s Greta Georges is nominated for Best Entertainment Host at the Asian Television Awards. Chained Insanity is a Finalist in the Social Issues Category of the New York Festivals. This documentary for Channel NewsAsia explores the ongoing challenge of caring for mentally ill people in Bali. Vintage Hunter: Season 3 is shortlisted as a Finalist in the Lifestyle Category at the Banff World Media Festival. Cantik Detektif, our first Malay-language programme, is the highest rated Malay lifestyle series on MediaCorp Suria in the first half of 2015. It achieves an average weekly rating of 15.4% amongst Malay audiences. Throwback: Balik Kampong, a reality show that takes 3 Singaporean families back to live in a 1960s village, is the highest rated local series on Sunday nights on MediaCorp TV 5. Fill My Tank is awarded the Best Infotainment Show at the 2nd Asia Rainbow TV Awards held by the Hong Kong Television Association and the China Television Production Committee. Junkie Monastery is awarded a Shift Award at the Florida Media Market, which honours shows that make a positive social impact. Junkie Monastery wins the Best Social Awareness programme at the Asian Television Awards. The documentary about a drug rehab programme in Thailand’s Thamkrabok Monastery is also Highly Commended in the categories of Best Direction, Best Editing, and Best Infotainment. Around the World with the Voyager for the History Channel Asia is recognised at the Diageo Marketing Brilliance Awards 2012. The John Walker & Son’s Voyager program (Asia Pacific) is given a Special Marketing leadership team award recognising “an activity, campaign or program singled out for special recognition for courage and daring and challenging convention.” Thank you to Diageo and Precious Media whom we worked with. Food Nation is a Finalist in the Documentaries Category at the New York Festivals. The Moving Visuals Co. is honoured as a Runner up for the Production Agency of the Year at the 2011 Marketing Magazine Awards. Woo Hoo Screenwalkers produced by The Moving Visuals Co. wins a Gold award at Promax Asia for Disney Channel Asia. The Moving Visuals Co. produces the ASEAN (Association of Southeast Nations) video presentation for World Economic Forum in Davos. Khim Loh speaks at the MIPDOC conference on Co-production with China at Cannes, France. Galen Yeo speaks at the SXSW International Documentary Co-production forum in Austin, Texas, USA. Mondo Magic Singapore is Highly Commended in the Best Entertainment Program category at the Asian Television Awards. The Gods of Rice wins Best Cinematography & Best Editing at the Moonrise Festival, Philippines. The Moving Visuals Co. is invited as a member to the International Academy of TV Arts and Sciences which oversees the International Emmy Awards. Khim Loh speaks at the International Documentary Co-production conference at the Broadcast Worldwide Conference (BCWW) in Seoul, Korea. The Moving Visuals Co. and Tan Kheng Hua produce 9 Lives – the first improvised drama series for Arts Central. Groom My Room achieves 12% ratings. Groom My Room – a Kids Makeover series for Kids Central achieves 12% ratings. The Gods of Rice airs on ZDF and Arte across Europe, and Discovery Channel in Asia. Co-produced with MDA. Jobs for Juniors is selected as a non-fiction finalist at the 2004 Prix D’Jeunesse TV Festival in Munich, Germany. Fat to Fit is a finalist at the New York TV Festivals. The Moving Visuals Co. becomes the first Singapore company to co-produce with German public broadcaster ZDF Enterprises. Healers: Journey Into Ayurveda is a Finalist at the New York TV Festivals. The Moving Visuals Co. produces Go Warrior – the first Asian produced martial arts travel adventure series to be co-produced with US Travel Channel and Discovery Channels worldwide. Food Chain is the highest rated info-entertainment series on MediaCorp 5. Secrets of Taroko achieves the highest ratings ever for Discovery Channel in Taiwan. Indonesia: Beyond the Reefs is awarded Runner Up for Best Natural History Program and Best Cinematography in the Asian Television Awards. 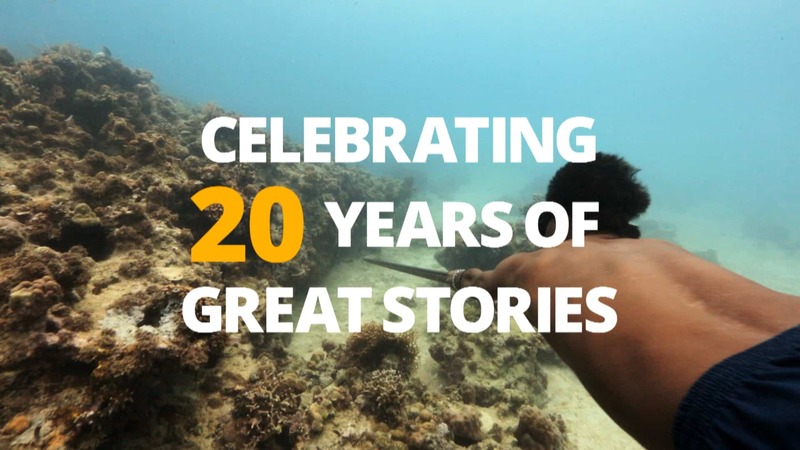 Indonesia: Beyond the Reefs is awarded the Best Environmental Television Series in Brazil’s 4th International Festival of Environmental Cinema and Video (FICA) – beating out other National Geographic entries in competition. The series is directed and shot by Robert Chappell, who shot the 2004 Oscar winning documentary The Fog of War. Khim Loh represents Singapore at the International Judging Panel at Banff TV and Film Festival. Hungry Ghosts is awarded Runner up for Best Direction (Long Form) at the Asian Television Creative and Technical Awards. Hungry Ghosts of the Chinese World is co-produced by The Moving Visuals Co.; Singapore TV 12 and National Geographic Channels Worldwide respectively. This marks the first co-production organized between a Singapore producer; Singapore broadcaster and international cable caster. The Moving Visuals Co. is the first Singaporean producer to make international documentaries for National Geographic Channel Asia. The Moving Visuals Co. is founded by Khim Loh and Galen Yeo in 10A Loke Yew Street.